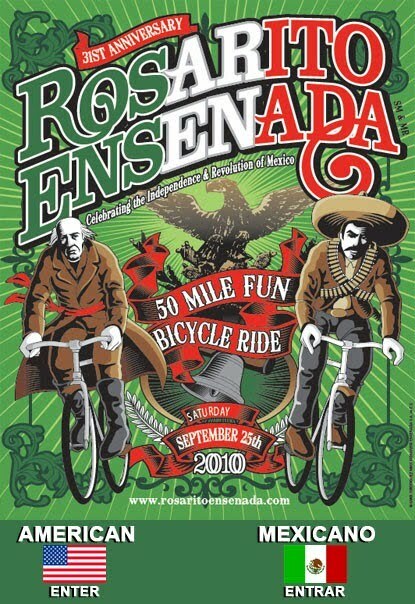 The Rosarito Ensenada 50-Mile Fun Bicycle Ride® is named an “Official Event” of the 2010 Bicentenario. In addition to the tourism revenue that is generated for the local Baja California economy, the Rosarito Ensenada Bike Ride also benefits the people of Baja with its ‘One Way Ride Program,’” Foster explained. 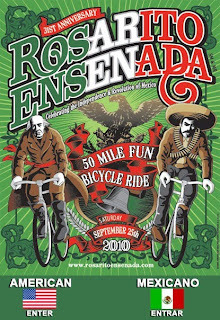 U.S. citizens can register to ride for a reduced price of only $35 USD (available online through September 22, 2010 at www.bettersignup.com), or they can register on the day of the event at the Rosarito Beach Hotel for $40. Mexican citizens can register in advance for $300 MXN at local Baja bike shops and gyms, or on the day of the event for $350 MXN. The event also offers commemorative t-shirts, cycling jerseys, and a free finishers medal for each rider. “Transportation packages are available from the United States for anyone who doesn’t want to drive,” Foster said. “Our tour partner buses riders and their bicycles, and because they return to the United State through the rapid SENTRI lane, our riders enjoy a quick trip back across the border.” Round-trip bus rides from San Diego’s Balboa Park are available with early online registration for $89 USD. Many hotels offer special rates and are also participating in the Border Fast Pass program which can cut border waits in half, especially on the weekends. MEDIA CONTACT & MORE INFO: Website: www.RosaritoEnsenada.com, Facebook: www.facebook.com/rosaritoensenada, Email: RosaritoEnsenadaBikeRide@gmail.com.